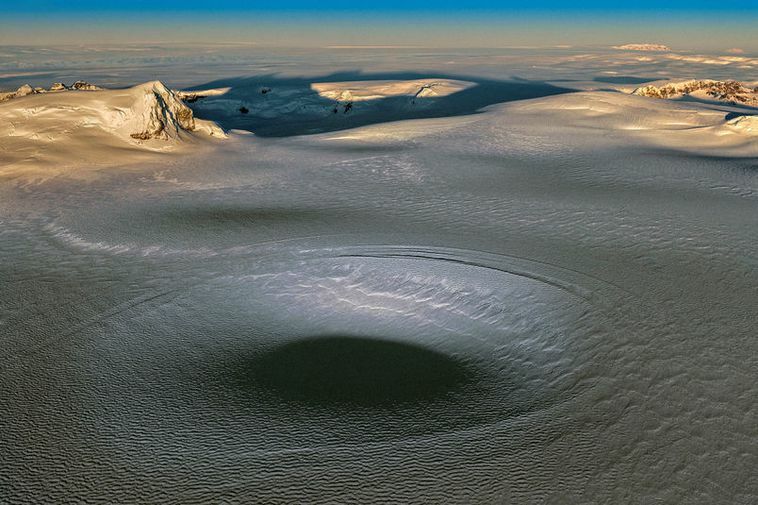 Scientists have studied new photographs of Öræfajökull taken yesterday and their findings show that the subsidence of the new ice cauldron is slowing down which points to good news; that the volcano is not about to blow. The cauldron in the Öræfajökull caldera has deepened by around 2-3 metres since the last flight across the glacier some two weeks ago. "Everything is somewhat slowing down," said Magnús Tumi Guðmundsson, professor in geology speaking to Mbl.is this morning. He believes either that geothermal heat is getting lower or that there had been ice melt from geothermal heat before the cauldron was spotted and that it has been collecting and depositing water for quite some time. "Whichever it is, it's good news that there is not more going on." However, he says that it's impossible to rule out whether a volcanic eruption will occur in the near future and that the interpretation of events at Öræfajökull by scientists still stands. Earthquakes in the area have been less frequent in the last few days but Guðmundsson says that the course of events is still going on. Findings show that the power of the geothermal heat in the ice cauldron is between 100 and 150 MW which is similar to cauldrons at Bárðarbunga. Considering how fast the subsidence occurred it is likely that water which had been collecting below it for weeks or even months had seeped forward. "Measurements show that the ice cauldron is almost circular with a diameter of 1200 - 1500 metres where it is deepest. Compared to most ice cauldrons this one is fairly wide and shallow for the time being."